...... The new version is more efficient and easy to use, we fixed many bugs and introduced new features like Unicode Support, builtin color picker and made formatting easy, this version is more user friendly with Step wise processing. This utility can FIND & REPLACE AND HIGHLIGHT multiple words in multiple Ms Word doc, docx and rtf files.It supports Word 2000, 2003, 2007 & 2010. It can Find & Replace each word in various files with different Criteria in batch mode. You can Find & Replace special characters like Paragraph, Tab, Lines as you do in MS Word Etc in many doc, docx, rtf files. 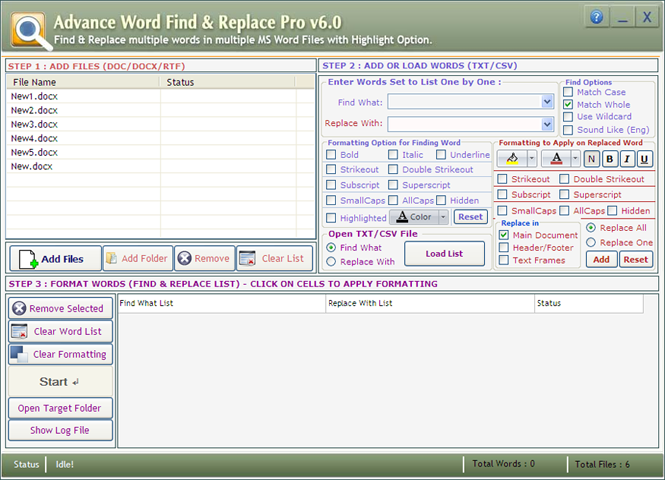 Using this Batch find and replace utility you can Find & Replace words with Wildcard utility in all Word files. This can help save days of your work. All in all it supports all Find & Replace functions of MS-Word, which you can use in a single batch process for thousands of files and words for processing doc, docx and rtf files. Qweas is providing links to Advance Find Replace Pro 6.0 as a courtesy, and makes no representations regarding Advance Find Replace Pro or any other applications or any information related thereto. Any questions, complaints or claims regarding this application Advance Find Replace Pro 6.0 must be directed to the appropriate software vendor. You may click the publisher link of Advance Find Replace Pro on the top of this page to get more details about the vendor.